This was the timeframe where I succeeded in freaking out my entire family when the news surfaced of my sudden heart attack. There were a lot of questions at the time, but all we could do was be patient and listen to doctor’s orders. After the initial drama subsided, I calmly lay in my hospital bed; reminiscing about things I hadn’t thought about in a long time. I turned my head and gazed out the window at the luminous city lights. Crazy how one day everything can be going fine – and then suddenly – change so fast. There was always something spinning on the turntable in my household. My mother would play Tom Jones records while dancing with the vacuum to songs like “Its Not Unusual,” and “What’s New Pussycat.” If my sister wasn’t watching The Monkees television show, or telling me off – she’d be listening to “Revolver“ by The Beatles. When my father got his turn, he’d choose to listen to his big jazz band favourites Gene Krupa or Benny Goodman. And when the music stopped, he’d reminisce about WW2. Then take out the harp that he stashed in his pocket, and play tunes like “When Johnny Comes Marching Home Again.” Afterwards, he would reply, “Do you want to hear it backwards?” He would then turn completely around and play the song over again. My dad was a serious character. However, the best scene was in the room I shared with my older brother. Eight years older than me and an aspiring guitarist, he would practice endlessly into the night as I pretended to sleep in the bunk bed above. (Later in life I realized just how much those early years influenced my taste in music) Unfortunately I was a bit too young to remember all the details of the music that surrounded me back then. However, I do recall many of the records he collected over the years. Now it was forbidden for me to touch his albums because of my age. But like any other kid I didn’t really listen well. So whenever he wasn’t home, I was all over those LP’s. There was one in particular I gravitated towards because I heard my brother practice along to it many times. Not wanting to get caught, I ever so carefully slid The Butterfield Blues Band’s East West record out of its cardboard sleeve and placed it on the turntable. I lined up the stylus ever so carefully, and it popped into its groove – without even as much of a scratch – this time! was one of those rare ensembles that were soulful, charismatic and incredibly influential. 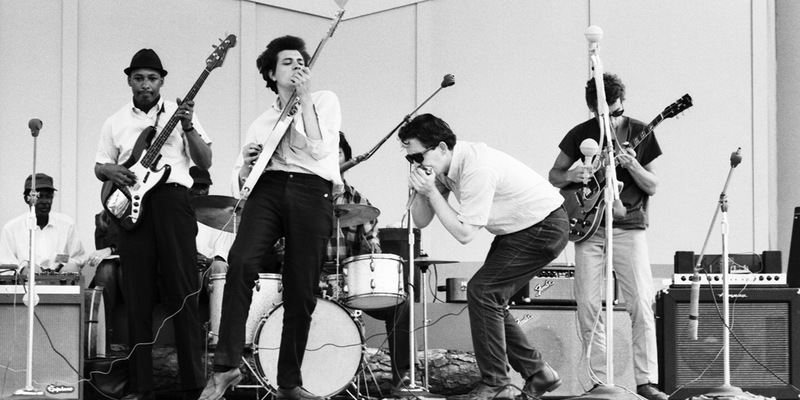 Two major players stood out as soloists in the group; Paul Butterfield, a talented harmonica player and vocalist, and Michael Bloomfield on electric guitar. On East West both get a chance to display expressive originality. The contrast between Bloomfield and Elvin Bishop’s more traditional solos are nothing short of spectacular. Butterfield was born and raised in Chicago’s Hyde Park neighbourhood. As a teenager, he studied flute and later developed a love for the blues harmonica. Teaming up with the blues loving Elvin Bishop, they both began hanging around musicians such as Muddy Waters, Howlin’ Wolf, and Junior Wells. Forming a band together with Jerome Arnold, Sam Lay and Bloomfield – they began introducing the blues to a whole new audience. Butterfield and Bloomfield composed the title track East West. This tune would create a unique shift in music history. It was more of a jazz eastern Indian raga piece with long improvisational solos by members of the band. At this point in time no one heard much of the sitar in blues, but Bloomfield manipulated his guitar to create a sound that was totally unique at the time. Butterfield complimented Bloomfield with a distinctive harmonica sound of his own. When The Paul Butterfield Blues Band played at The Fillmore in San Francisco in the summer of 1966, the word spread and dozens of local bands followed in the style of East West; helping to create the psychedelic sound of Haight Ashbury. East West was never commercially successful, but it was critically acclaimed. I’ve listened to it several times lately, and considering this album came out in 1966, it sounds fresh and unique even today. The Paul Butterfield Blues Band was indeed revolutionary and created a sound that emerged as the dominant rock music of the late 1960s. During some of those nights back in the hospital in October 2007, I started the thought processes that would eventually bring this blog to life. Through the persona of The Blues Blogger I utilized the healing power of music and re-discovered my love for writing. When I think back and reflect on all the tunes that took place back then, it’s no wonder I developed an innate passion for music. The Paul Butterfield Blues Band’s East West stands out as a timeless and remarkably influential electric blues LP even after 50 years. It sure influenced me and the creation of this blog. The recording would have a tremendous impact on the electric blues scene and the rest of the music world. If you’re not familiar, and love the blues, this is a must! It will explain so much about the influences of so many musicians. So now it’s your turn? Did the album East West by the Paul Butterfield Blues Band play any significance in your life? Any stories you’d like to share? Please leave your comments below. I’d love to hear from you. I saw the Paul Butterfield Blues Band at the Grande Ballroom in Detroit and they were amazing. I wish I had your magic way of listening back then, I would have appreciated them even more! East West and PBBB in general were one of the most influential bands of my teen days. I wore out my LP of EAST WEST, but still keep it as a testament to my devotion to this epic band. Thanks so much for keeping the flame alive. Talk of remembering music and the influence’s they had! 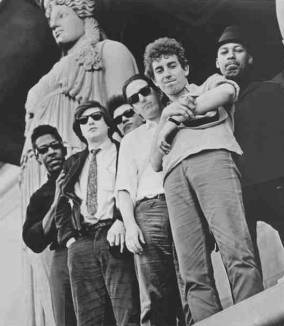 Paul Butterfield Blues Band,awesome.In 1967 I was hitchhiking from Vancouver Island,British Columbia to Chicago and at one of the many places I ahd stopped one of them had lots of blue’s playing and the one that stood out the most at that time was PBBB!I loved it. It was the first album I bought when I got to where I was going.It suited Chicago for me at the time.Loved their music then and still love it today.It was new,fresh,different and awesome.Thanks for the great Blog,as usual.Keep it coming. Great tribute to 1 of the “greatest blues albums ever conceived”… the Paul Butterfield Blues Band… with “East West”… from 1966 !! Still as great today as when I 1st heard it in ’66 !! Thank you Blues Blogger and “Happy 2nd Anniversary”… of your blog… and of your recovery from that “fateful day”… but out of that came your fantastic contribution to our world… “The Blues Blogger’s: Jazz and Blues Review” !! Was fortunate enough to hear this music in the late 60’s and although I understood I loved the music I never knew why it spoke to me. Always loved In my own Dream. I was fortunate enough to hear this musician in his heyday and truly dug their sound although I certainly did not hear their genius until many years later. We spent many a night partying down to Drunk Again and waking up to Morning Blues. Certainly seems to my tin ear that this man should be in The Hall of Fame as he responsible for spreading the Blues beyond Chicago and into the Suburbs of America. I will surely have IN MY OWN DREAM playing at my memorial. i remember listening to these guys when i was a young girl and listening to them today i still want to get up and start dancing !! What a great blog with as usual great music and wonderful information!! Happy 2nd Anniversary and i hope many many more!!! I saw Paul Butterfield many times in Monterey while growing up. Was and still is one of my favorite bands. The first paragraph had me in a hospital bed contemplating. So very skillfully written. I’ve already commented on Paul Butterfield, above. Thanks my dear friend for writing what so many of us experienced listening to this band. Paul Butterfield has been one of my personal favorites from the very first time I heard him in early 1967. I have most of his material on Vinyl or CD. He’s been one of my greatest influences in appreciating the blues. Butterfield is one of the things that kept my heart beating. I have been and will always be a fan of his and his music. I first heard them play live at the Band Shell in Central Park in NY. They were incredible. They played Love March that day. They have left an lndelible impression in my soul ever since. I know I commented last this was posted but since I received it again I will comment again. This album for me has to be within my Top5 all time favorites… and I do remember seeing Paul Butterfield several times… but I couldn’t tell you the years !! I’m fairly certain about seeing this band at least once in Oakland at those “A Day On The Green” concerts Bill Graham used to put on !! Those days were fantastic as far as seeing top name bands all in one place at one time… for about $15 bucks… for at least four bands if I remember correctly !! I bet the BluesBlogger would know what year and the band’s members when they played there !! How’s that for talking up the Blues Blogger… 🙂 !! Thanks again BB for this great post !! I heard the East West album when it first came out. Even today, sometimes when I pick up a guitar I try and then fail to put together that first fret board run I still remember from Work Song. I still wonder how the album was made. I don’t know who was in the studio when it was put together but “Work Song” sounds like a single take and not a patchwork of takes. Perhaps there was a very talented mixer around at the time but it sounds pretty seamless to me at least. I, and many people I know think it’s inexcusable that BBB is not in the HOF. I would like to know if there is an online petition trying to right this grievious wrong. We would sign in a heartbeat. “The late Paul Butterfield was world-wide renowned as the legendary blues harmonica player that was pinnacle in the blues revival of the sixties. And one of the first integrated bands, helping to bring a predominantly considered black style of music into white homes, increasing the popularity of this style of music; likewise, merging blues and even folk music into a blues rock. You can read the complete petition by clicking here. I’m not certain if there is any effort to have The Butterfield Blues Band inducted in the Rock n Roll Hall of Fame…they certainly should be they were incredibly influential and also as Paul used to tell me, and he was very proud of as Al Aronowitz wrote of in life Magazine many years ago.. I hope some day the Hall of Fame grows up..and gets hip to others as well..
One of the best Blues Bands of all Time! !